Publication from Cork UP: E. OE. Somerville and Martin Ross. Female Authorship and Literary Collaboration. 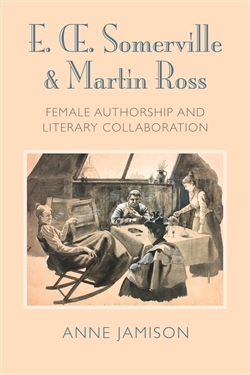 Anne Jamison’s new book on female authorship and literary collaboration explores the remarkable literary partnership of one of the most prominent and successful female writing duos at work in the late nineteenth century; Irish authors, Edith Somerville and Martin Ross. Based on extensive and original archival research, this book attempts to reorient traditional thinking about Somerville and Ross’s partnership as a purely domestic and personal affair. It takes its cue from the legal aesthetics of nineteenth-century authorship and copyright and significantly expands the existing parameters of debate surrounding these authors and their dual artistic practice. In doing so, this book interrogates the idea of collaboration both from the point of view of Somerville and Ross, their publishers and readers, as well as the duo’s texts. This book thus attempts to deepen and challenge current literary history’s broader understanding and treatment of nineteenth-century female authorship in particularly resonant ways. ← Post-Agreement Northern Irish Literature: Lost in a Liminal Space?